It might be up on the second floor and in the smallest gallery space in Haw Contemporary, but Amy Kligman’s exhibition “Everyday” speaks volumes. True to the exhibition’s name, Kligman paints ordinary and everyday objects: lighters, hair clips, a sheet cake, a bowling trophy. With a loose brush and attention to detail, Kligman paints objects that we’ve all seen, but that we also look past. The kinds of objects that don’t seem important, but can hold deep emotional memories. 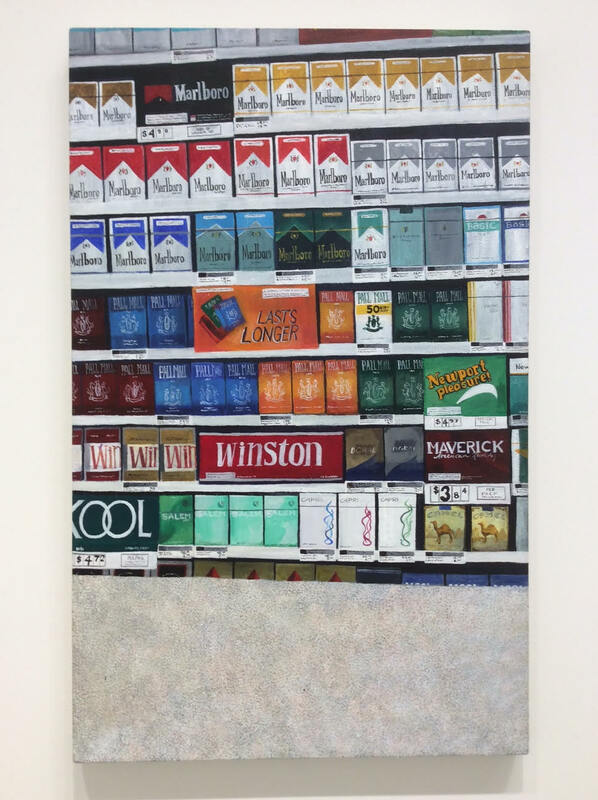 By far, Kligman’s most detailed work is “Two Packs a Day.” The 40”x25” painting depicts a familiar scene, the wall of cigarette packs behind the counter of a convenience store. Dozens of Marlboro and Pall Mall packs are lined up in rows, in all their different varieties and pack colors, each label meticulously painted down to the last detail. The endless wall of tobacco is cut off at the bottom by a countertop, where customers might place their purchases. This counter takes up about a quarter of the painting, and a surprising amount of attention has been given to recreating its speckled, textured surface. 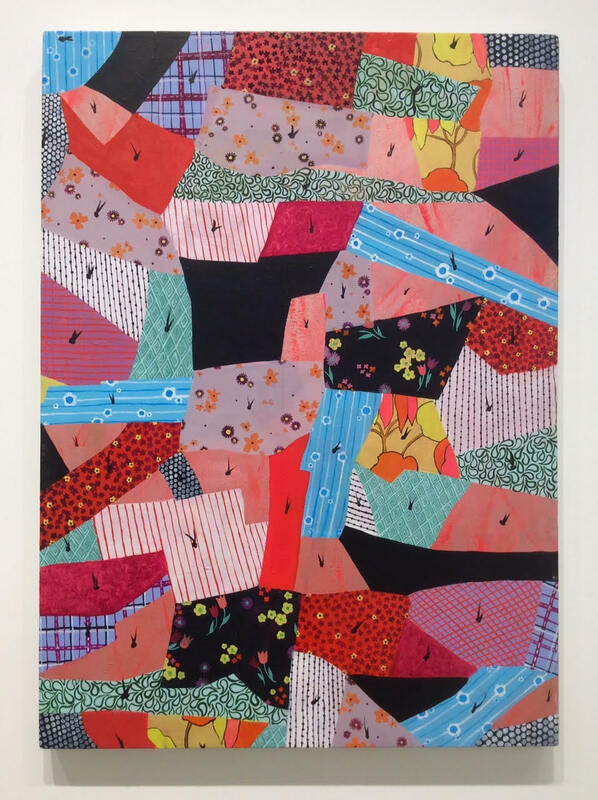 Another great piece is “A Gift forStaying Warm.” The painting shows a patchwork of crazy patterns, the kind you might find on pajamas or bedspreads in a teen’s bedroom: quirky floral prints and stripes, lots of pinks, reds and teals. Inspired by her grandmother’s quilts, the painting is similarly, meticulously handmade, with each brushstroke visible. Kligman’s paintings are not graphic works of Warholian Pop Art. They might depict consumer objects, but Kligman’s loose, soft brushwork gives these objects a second-hand feeling, like picking them up in a thrift shop or pulling them out of a closet. 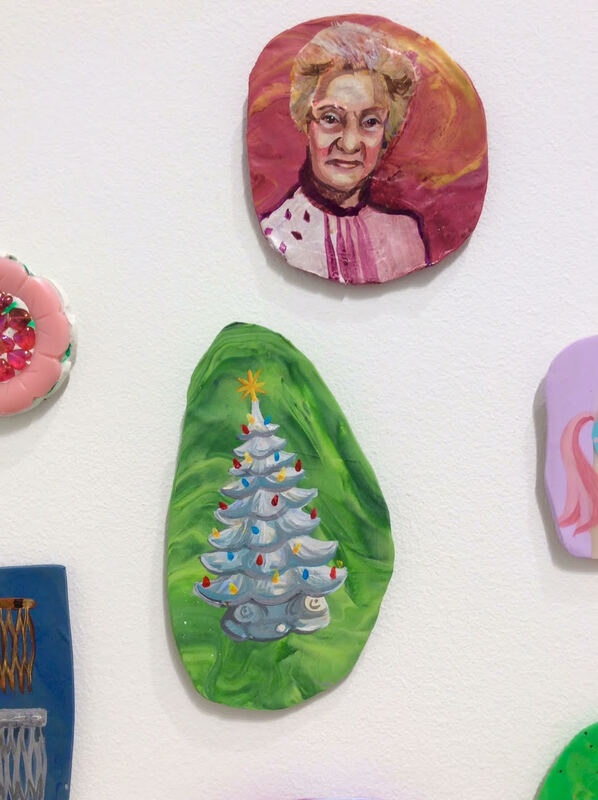 The highlight of the show is “Self Portrait in Four Generations.” Forty small paintings, each only a few inches across, are arranged like a wall of family photos. The paintings are flat, but not square. Each is a unique, oblong, rounded shape made of Sculpey, a children’s crafting material. Painted on these shapes are familiar objects: a cheap yellow lighter made of transparent plastic, a can of StarKist tuna, a folding patio chair, a disposable pink razor, a plastic milkcrate, a saltine cracker, a packet of sugar, a raffle ticket, hair clips, Diet Pepsi, a box of Kleenex, a can of LaCroix sparkling water. Nestled among these everyday objects are four little portraits, including a self-portrait of Kligman and other members of her family. 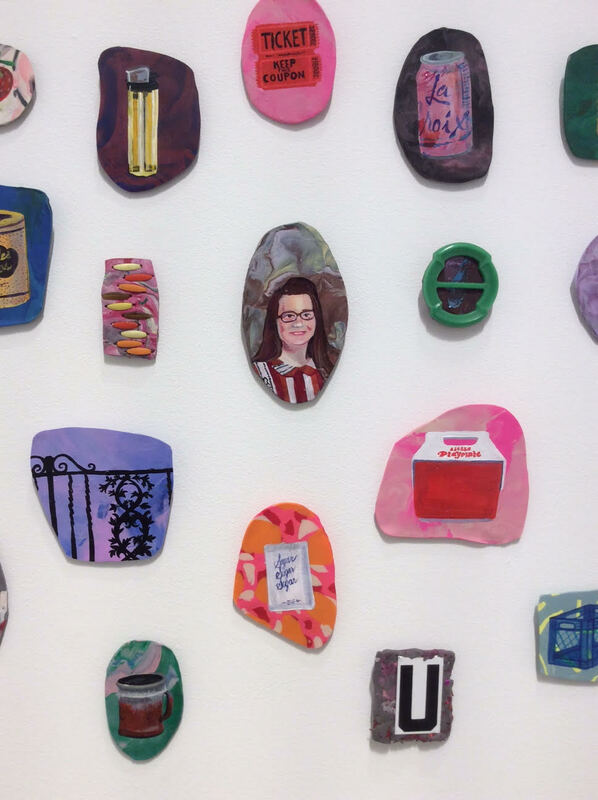 While this installation of paintings feels highly personal, like opening a family photo album or watching a VHS tape of an old birthday party, there is something very relatable and very American about the exhibition. These objects might be from the artist’s own life, but they likely relate to yours. Do you remember sitting on a plastic milk crate? Do you remember eating a simple, yet tasty sheet cake? Have you ever been handed a highly generic raffle ticket at some carnival or festival? These aren’t universal experiences, they come from a specific culture and specific point in history. Perhaps, in hundreds or thousands of years, historians will find these paintings helpful in deciphering a lost culture. But more importantly these paintings form a set of economic signifiers: that of the American middle and lower classes. Kligman specifically chose the smallest room at Haw Contemporary and it fits the intimate scale of her work, but more interestingly, to reach her exhibition you must first pass through Haw’s much larger downstairs gallery, filled with enormous abstract paintings. 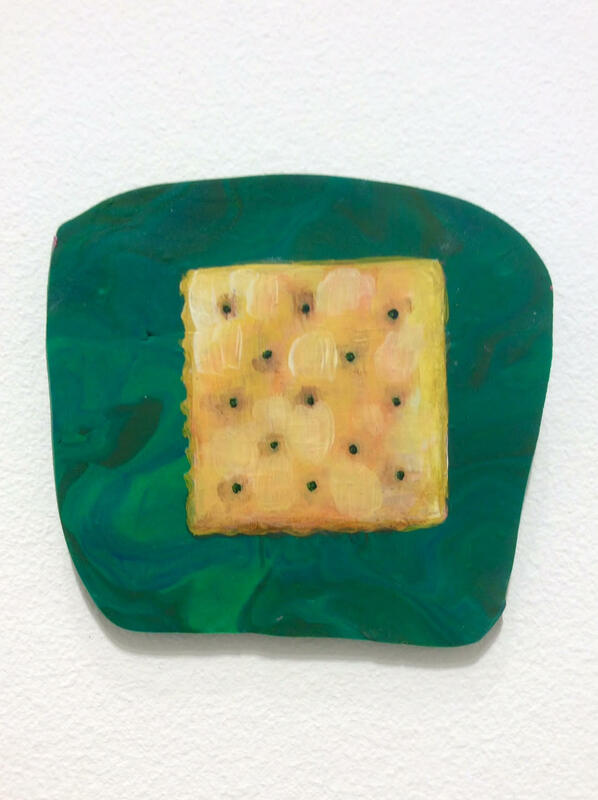 Moving between the galleries, there is a culture shock from the ‘High Art’ of abstraction to realistic paintings of everyday, ordinary, objects. There is something subtly political about this. It is not a condemnation of wealth or high art, but an insistence on making the forgotten, the ignored, the everyday into something visible, cherished and important. Nearly every object Kligman has painted is probably in a landfill or avoiding that fate because it is a cherished keepsake or souvenir. And quite likely every one of these objects has been recreated a thousand times or more, which make Kligman’s painted recreations humorously redundant. 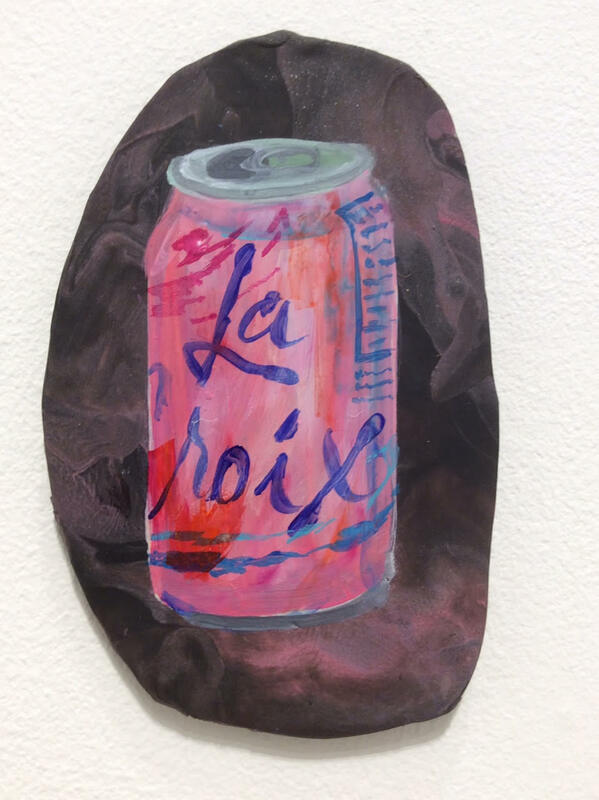 But Kligman is doing much more than a Pop Art duplication of consumer objects, she is insisting that her history, her memories (and perhaps yours too), become immortal. “Amy Kligman: Everyday” continues at Haw Contemporary Stockyards, 1600 Liberty St., through Aug. 9. Hours are 9 a.m. to 5 p.m. Tuesday-Friday and noon to 5 p.m. Saturday. For more information, 816.842.5877 or www.hawcontemporary.com.